Florida has had some colorful public servants over the years: a governor who claimed the Pope had sent hit men to kill him; a congressman who took payoffs from a fake sheik and then claimed he was collecting evidence for his own investigation; and, more recently, a U.S. senator who flew on the space shuttle and also went python-hunting. And then there is Ronald “Alligator” Bergeron, a former state wildlife commissioner whom Gov. Ron DeSantis just appointed to the South Florida Water Management District governing board this past week. “She’s a personal friend,” Bergeron explains. “Alligator Man” only hints at Bergeron’s many qualifications to be the most Florida of all Florida office holders. Bergeron is a mass of contradictions: An avid hunter who as a state wildlife commissioner cast the lone no vote against holding the first bear hunt in 21 years. A rancher who professes a love for Florida panthers, even though they have eaten some of his calves. A developer who says his great passion is restoring the Everglades. “His commitment to the protection and restoration of the Everglades is unmatched and I think he will be a tremendous leader for South Florida,” DeSantis said in a statement announcing Bergeron’s appointment. DeSantis had previously demanded every water board member resign for approving a lease favor the sugar industry over Everglades restoration. However, Bergeron may face a conflict of interest. According to his website, one of his companies, Bergeron Land Development, has a $79 million Everglades restoration contract with that same water agency to build stormwater treatment areas to clean up pollution in farm runoff. Bergeron has come a long way from the boy who watched his parents build their first home using old freight boxes salvaged from the nearby port. That house flooded often, back before the Army Corps of Engineers rejiggered South Florida’s plumbing with canals, pumps and levees. Back then everyone would just head for high ground until the flood receded, then clean up and start over, Bergeron said. At 18 he left his home in Davie with just $235 in his pocket. He was a millionaire by age 25, but kept living in a trailer until he was 41 so he could invest his profits. Now he’s the CEO of a group of companies with interests that range from highway construction to rock quarries to hurricane debris cleanup. 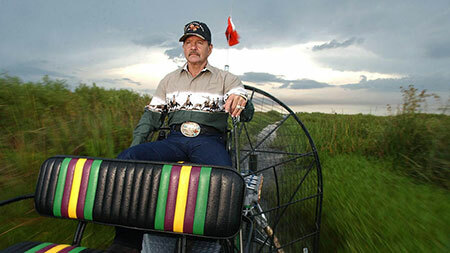 The family member who influenced him the most was his grandfather, an Everglades game warden named Lonnie P. Harvey. When Bergeron was a small boy, his grandfather brought him out into the River of Grass and showed him its majesty in those pre-Corps days. “I will never forget the beauty he showed me in the woods and the environment,” he said. Whenever dignitaries from Washington want to view the Everglades, it’s Bergeron who always plays tour guide, piloting his airboat around what’s left of the world’s most famous marsh. Party doesn’t matter. He took both Bush and Obama Administration officials around in his boat, and when then-U.S. Sen. Bill Nelson, a Democrat, went on a python hunt, Republican Bergeron was his machete-swinging partner. During his 10 years on the Florida Fish and Wildlife Conservation Commission, he helped cook up the state’s python hunt, argued for maintaining current protections for the panther and led the fight to make sure there wasn’t a second bear hunt. He is the only wildlife commissioner ever appointed to the board after being investigated for molesting an alligator — the source of his nickname. In 2006, Bergeron was giving visitors a tour of his 5,000-acre Hendry County ranch when he spotted an alligator sunning itself near a pond. Although the gator appeared to be 7 feet long, Bergeron “demonstrated what he called ‘an old cracker tradition’ to his guests” and “began to wrestle with the alligator,” an investigator from the state wildlife commission later wrote. The gator let go. Bergeron swam to the surface and went to a nearby hospital, where his fingers needed stitches. State law forbids attempting to take, pursue, molest or capture an alligator without a license, and Bergeron basically confessed to the wildlife investigator about jumping on the animal. While his fingers were still bandaged, Bergeron attended an event at the White House and met then-President George W. Bush. Bergeron explains what happened next. Information from the Sun-Sentinel and the Florida Times-Union was used in this story. Contact Craig Pittman at craig@tampabay.com. Follow @craigtimes.